Alec Anderson has put his pursuit of an Olympic Games berth on hold for now and has joined a team seeking to qualify for the September 22-29 ISAF World Championships in Massachusetts, during the first qualifying opportunity in Florida, February 23-25. The BVI which joined the Olympic Games family in Los Angeles in 1984 with Sailing and Track and Field as the first sports to represent the territory, hasn’t had an Olympic participant since the winds went out the sails of Robbie Hirst during the 1996 Atlanta Olympic Games. Since Hirst, an IASF World Jr. Championships Laser silver medalist in 1987 became the first BVI athlete to ever win a medal at any sport World Championships event, Alec Anderson tried to end the 20-year drought by qualifying for the 2016 Rio Olympic Games. He and 49er sailor Chris Brockbank, came up two places short of the mark. 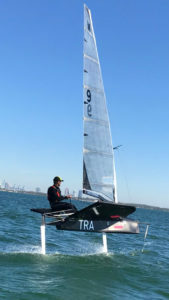 Brockbank has since retired from competitive sailing and Anderson has turned his attention to developing his professional career and won’t mount a campaign for the 2020 Tokyo Olympic Games. The Moth, an 11-foot single handed foiling boat, is not among the Olympic classes but Anderson said it’s the future of sailing. He’s getting the boat put together properly he said and learning the basics, but the plan is to race it in the ISAF World Championships eventually. “Sailing is evolving more and more to foiling, where the boat hydrofoils above water,” Anderson explained. “I need to progress with the sport, plus, it’s a nice personal project while I work professionally. I’m really excited about it though. Will be a great challenge and will only make me a better sailor going forward. When asked what he’s looking for in 2018, Anderson said he recently got engaged to Elsa Fonseca and he’s excited to get married this year. Anderson, who arrived in Tampa, Florida last week after a stint in Belgium, will spend three weeks there training. He’s heading to Miami for a qualifier, February 23-25, as he trims the spinnaker, sailing with Bennet Greenwald of San Diego, CA, on Perseverance in the j70 Class. They’re hoping to use the first opportunity to qualify for the September 22-29, World Championships in Marblehead, Massachusetts.